Your business deserves the best communication solutions available. Millions of consumers and businesses not only in South Africa, but around the world, have embraced internet fax technology to the benefit of their businesses. You no longer have to pay for a dedicated fax line or for the expensive consumables involved in operating a conventional fax machine. The internet fax continues to revolutionise the way the world communicates. In the past you had to be physically present with your fax machine to send and receive a message from your number. Today, you only need an internet enabled device to receive and send faxes from wherever you are, at whatever time of the day or night. Since there is no limit to the amount of accounts you can register, each of your employees can have their own fax to email account. In the past you had to print out every fax message received in order to judge its validity and relevance. This also meant you had to pay for printing spam messages and unsolicited faxes. Now you can view all faxes on your computer or mobile device before deciding to print it, and simply forward it to the relevant department in your office. These are only a few of the many great ways that you can save money with this incredible technology. 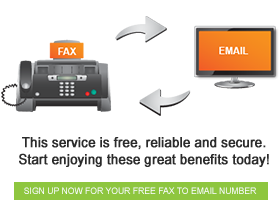 Take your business into the future with free fax-to-email technology.